← Announcing . . . The Alive with Clive Monthly Contests! As the founder of The Alive with Clive Global Community (“The AWCGC”), my mission is to create synergies between companies, charities, singer/songwriters and Members of The AWCGC so that the life of everyone who is any way connected – either directly or indirectly – to The AWCGC is enhanced as a result of that connection! With this mission in mind, I’d like to introduce you to Kathy Branch, who is now a Licensed Massage Therapist. Historically, while I have always had a workout two to three times a week, I have not been one to have a massage with any degree of regularity. In December last year, I injured my right shoulder in doing more than 10 pullups on a pullup bar. This injury continued to plague me for the last five months, so much so that I had almost become resigned to living with the pain in my right shoulder for the rest of my life. A couple of sessions with a physiotherapist while I was in Cape Town this past January helped, but didn’t alleviate the pain, and while self-administered shoulder massages with IcyHot also provided some relief, I continued to experience lingering pain in the region of my right shoulder all the time. Kathy knew 30 years ago that she wanted to be a licensed massage therapist. Life intervened, however, and in the past 30 years, in addition to raising four children who are now age 28, 26, 24 and 18, she was a police officer for 25 of the 30 years. In 2012, she got back in touch with her dream and became a licensed massage therapist within seven months. She also teaches swimming and is a certified water safety instructor. She told me she is now in action to develop a practice of going to people’s homes and offices to give them massages. “Would I like to give her a try?” I said sure. After an hour on Kathy’s table in my apartment this past week, the pain in my shoulder has disappeared. In addition, Kathy told me that my spine was out of alignment. With a few stretch moves she performed while I was on her table, I no longer feel pain after I bend over to tie my shoe laces or tuck in the sheets to make my bed. In short, I am getting used to living each day without having to deal with the aches and pains to which I had become accustomed and which I had attributed to the stresses and strains of modern-day living. Kathy is keen to develop a loyal and supportive clientele and I am eager to receive my next massage from Kathy as soon as possible. So, while at the gym a couple of days after my massage, I found myself creating an idea for Kathy and me to work together to create synergies that will benefit her, you and me. Kathy provides massages mainly in Manhattan and Westchester, although I’m sure if you’re willing to pay for her to go to Hawaii or any other similarly idyllic locale, she’ll willingly oblige! Gifts to charities to help them raise funds. I also said I’d give Kathy three sets of four Alive with Clive Mugs, shown below, that are available for sale in The Alive with Clive Gift Store, to give away to the first three people to pre-pay for four massages so they get a fifth free. Within an hour of the implementation of this idea, one person pre-paid for one set of four massages to obtain a fifth free, so now . . . 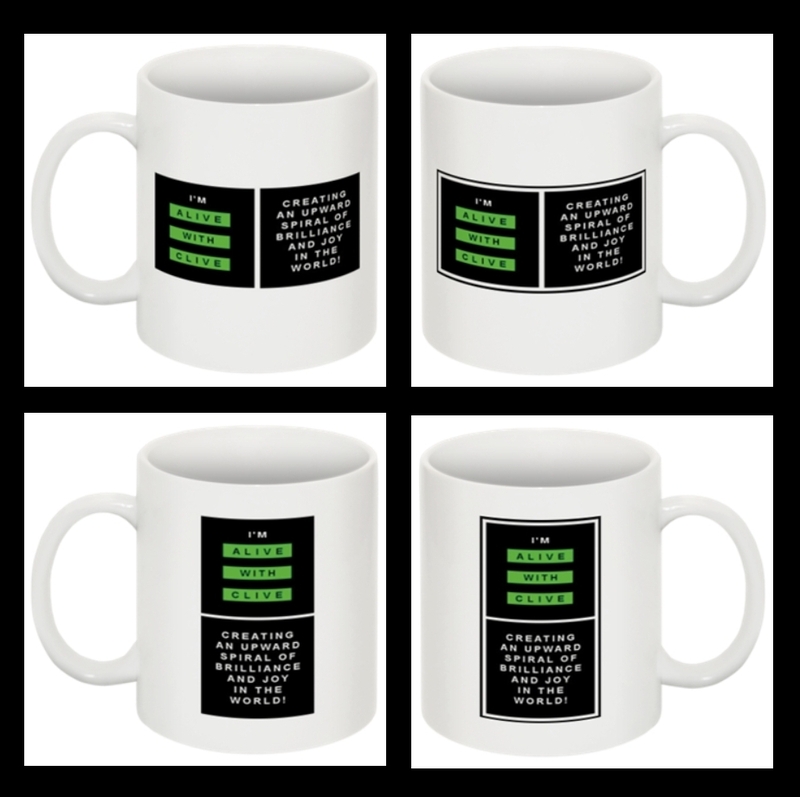 If you are one of the next TWO people to take Kathy up on this incredible offer, you too will also receive the beautiful set of four Alive with Clive Mugs, with free shipping – a gift worth over $120! So don’t delay. Be one of the next two to jump on this offer so you can receive the beautiful set of four Alive with Clive Mugs, or, if you aren’t one of the next two, at least pre-pay for your four massages to get your fifth free before Kathy raises the price she charges for her massages or becomes so busy that she compels me to remove this offer from the Internet immediately. To pre-pay for your four massages from Kathy so you get your fifth one free, click on the Buy Now Button below. If you are one of the next two to order your massages, I’ll let you know within 24 hours from the time you pre-pay for your four massages to get your fifth one free that you will be receiving your set of four Alive with Clive Mugs soon. When Kathy provides a single massage, she charges $125. For those who are willing to pre-pay online for a single massage, however, she charges just $105. If you’d like to pre-pay for just one massage and save $20, click here. I highly recommend you take advantage of this phenomenal opportunity to discover what a massage from Kathy — or a few — can do for you! P.S. Kathy has also generously offered a FREE one-hour in home or office massage as a Prize in the inaugural Alive with Clive Monthly Contest. To find out more about the contest and the Prizes, click here. This entry was posted in Clive's Perspective and tagged 7 months, aches and pains, Alive with Clive, Alive with Clive Global Community, Alive with Clive Global Community mission, Alive with Clive Monthly Contest, Alive with Clive Mugs, Alive with Clive TV Show, bed, bend over, charities, clientele, companies, connection, enhance life, fifth massage free, free massage, gym, Icy Hot, IcyHot, in touch with dream, in-home massage, in-home massage in Manhattan, in-home massage in Westchester, in-office massage, in-office massage in Manhattan, in-office massage in Westchester, injury, Kathy Branch, Kathy Branch massage therapist, licensed massage therapist, licensed massage training, loyal following, massage, massage as customer appreciation gift, massage as incentive to sell products, massage as sales contest award, massage clientele, massage for friends, massage gift certificate, massage in Manhattan, massage in Westchester, massage incentive to sell services, massage raffle for charity, massage table, Members, mission, modern-day living, pain relief, physiotherapist, plague, police offer, postcard, pre-pay for four, prizes, regular massage, relief, right shoulder injury, self-administered shoulder massage, Set of 4 Alive with Clive Mugs, shoulder injury, singer/songwriters, spine, spine out of alignment, stress, stresses and strains, stretch, supportive clientele, swimming, therapist, tie shoelaces, training, tuck in sheets, water safety instructor, win prizes. Bookmark the permalink.